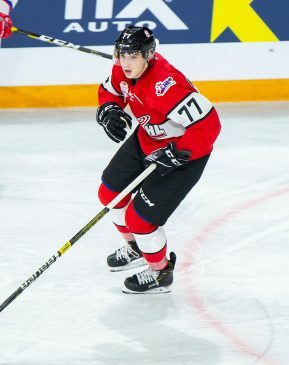 The 2019 draft may still be seven months into the future, but it is not too early to start narrowing our focus on those young players who are primed to be top selections in Vancouver. Of course, some of these names were already in the spotlight as much as two or three years ago. When was the name of Jack Hughes not bandied about by the prospect cognoscenti? Even a league like the WHL – which is the league to scout this year – with its Bantam Draft popping 14 and 15 year olds, which never fails to elicit a think piece or two about the folly of projecting players so young, is putting that to the test, as the top three players selected in the 2016 Bantam Draft are all listed among our first top 31. In addition to that big three of Peyton Krebs, Kirby Dach, and Bowen Byram, that 2016 first round also included projected first rounders Dylan Cozens (19th overall), and Matthew Robertson (seventh overall). The other players selected in that first round needn’t feel too bad as seven others are in our “Honorable Mention” grouping, and others are sure to feature here as the season progresses and we expand our rankings. In addition to the WHL, the USNTDP has another extremely strong class of players this year, led by the aforementioned Hughes, who is not surprisingly our top ranked player. He is joined by winger Matthew Boldy (9th) in our top ten, Cole Caufield (11th), Alex Turcotte (14th), Cameron York (17th), and Trevor Zegras (18th) in the top 20. Teammates John Beecher (25th) and Marshall Warren (30th) are also in our early first round and there are others in the honorable mention chomping at the bit. Of note among that next tier, netminder Spencer Knight is making us consider our longstanding philosophy of avoiding goalies in the first round. 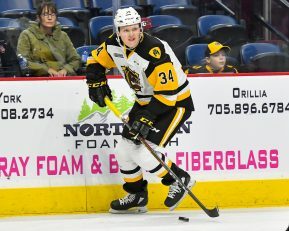 He may be that good, and another month like the last one will both get him on to the American WJC squad and place him in our second look at the top 31. There are some other good netminders this year, most notably Dustin Wolf and Taylor Gauthier, both WHLers currently ranked in the Honorable Mentions, but Knight is the only one who has the chops to break into the rarified air of first round goalies. In a reversal of the standard state of affairs, the QMJHL has more high end talent than the OHL this year. The latter only placed two players in our top 31 in Ryan Suzuki (10th) and Arthur Kaliyev (20th). The Q, on the other hand, has Raphael Lavoie (7th), Jakob Pelletier (22nd), and Samuel Poulin (26th) at the moment. In fact, before we get to draft day, there may be as many non-USNTDP USHLers in the first round as there are OHLers, as Robert Mastrosimone (29th) could be joined by Bobby Brink (HM), who has started his draft year on a blistering pace. The European talent is split pretty evenly between Finland, Sweden and Russia, with all three countries likely to see 2-4 players selected in the first round and each one placing a player in the top ten. 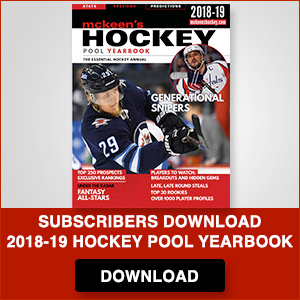 It is too early to hone in on specific trends in the draft class, as much will change as the season progresses and many NHL scouts really only begin to bear down on the talent at hand after the holidays, but it is fair to note that the forwards have the upper hand this year, with only 10 blueliners ranked in our top 31. Even looking at the 37 players ranked in our Honorable Mention, only eight more defensemen are listed. Again, things will certainly change as the months fly by, but this may be something to keep in mind. Finally, a note on the Honorable Section. The 37 players listed alphabetically there are not ranked in any order and are not even necessarily the next 37 best prospects. They are simply a grouping of players who have all created fairly positive impressions already but not positive enough to be in our top 31. As we refine our rankings more over the coming months, we will grow more certain in our scouting looks at the class of 2019 and expand our hard rankings accordingly.